After nearly eleven months of fighting in Northern Mali and local pleas for foreign intervention, the UN is now poised to approve of a plan assembled by Economic Community of West African States (ECOWAS) to reestablish the Malian government’s territorial integrity throughout the country. But while the fate of the political territory of Mali may be accounted for by this decision, it remains unclear how the integrity of the Malian people – complete with over 200,000 internally displaced people (IDPs) according to Refugees International – will be handled. 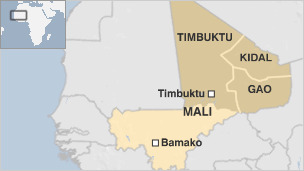 The strategy, known as MISMA, will send 3,300 troops into Mali to assist 5,000 Malian security and defense forces into the north of the country, where the country is currently run by a number of different rebel forces including the Tuaregs, Ansar Dine, and the Movement for Unity and Jihad in West Africa (MUJAO) and allied al-Qaeda forces. Yet any push by this campaign likely won’t be made for at least six months – around a year, according to Jack Christofides, a leading officer of UN peacekeeping operations in Africa – to account for general operational training and education, gather all of the needed troops, and perhaps to leave a window for diplomatic solutions. This stretch of time can seriously affect thousands of more Malians, who are already struggling with ethnic and gender-based violence, a dramatic food shortage due to an unfortunate drought, and no access to basic necessities like work and healthcare. According to Alice Thomas, a managing member from Refugees International, most IDPs stay with family members in the South of the nation. Of the 200,000 IDPs overall, approximately 186,000 IDPs are located in Southern Mali. These “host” families often take between 14 and 18 relatives – direct and distant – into their homes. While being with family is a more positive living experience than being crammed into refugee camps, it has made it difficult for aid groups to identify and provide assistance to those in need. Thomas confirmed that there is not nearly enough money going to helping those in Southern Mali now. Indeed, while Northern Mali is receiving the most media attention because of political instability and the implementation of Sharia law, it’s the South that needs the most support in the interest of Malian people. Unfortunately, there is unlikely to be any sort of discussion on a proactive, holistic form of civilian support for Malian people within the UN anytime soon. Even while the UN will participate in humanitarian assistance activities, their operation to Mali is grossly underfunded. In addition to a lack of humanitarian assistance for refugees, there simply is not enough protection for civilians, as evidenced by continued fighting between factions. The fleeing of Malians – 400,000 refugees in all including those who have fled into neighboring states – has prompted the need for humanitarian support; but it is not clear how exactly a military intervention will support those in need; rather, there are concerns that more violence will only make it more difficult for groups to get aid to refugees. Of course, an end to hostilities in the North is necessary as soon as possible. There are 400,000 Malians who wish to return home. It is possible that a military operation could restore the area and allow all of these refugees to go home. Indeed, the military intervention has been endorsed by foreign and defense ministers from Germany, Italy, Spain, Poland and France. But regardless of when and if a military operation hits Northern Mali, there is much to be done to ensure the safety and welfare of Malians between now and then. For one, Mali has a coming election in April to fully reestablish its democratic government (at least in the South), and this will need to go smoothly. In addition, Mali and other acting governments should continue towards political solutions wherever possible to reduce the amount of fighting. But most importantly, civilian protection and aid for those in need should be a top priority for the international community.